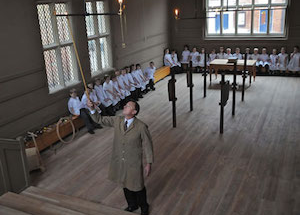 The Wilderspin room is at the heart of the school, where period documents and archaeological evidence have been used to recreate Wilderspin’s original classroom. This is complete with gas lighting and tiered seating gallery, designed so each pupil can see the teacher and teaching posts. The picture on the left shows pupils from Bowmandale Primary School in Barton-upon-Humber looking on as John French acting as caretaker lights the gas lamps so they get a taste of 19th century school life.